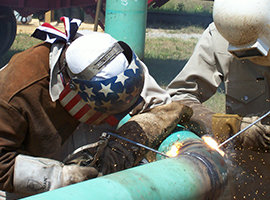 First among CECO Pipeline Services' core values is "Never Compromise Safety." Our management is committed to providing a safe work site for both employees and customers, while protecting the public and the environment. Daily JSA (Job Safety Analysis) meetings are held and documented throughout the company. These are reviewed and updated for changing conditions. All employees are encouraged to bring forward safety suggestions and are empowered to stop a job if they see an unsafe condition. Annually, CECO Pipeline Services provides numerous safety trainings and certifications to our employees in order to make our work sites safe. Our full-time, dedicated safety professionals train our employees and audit our work sites on a continual basis.